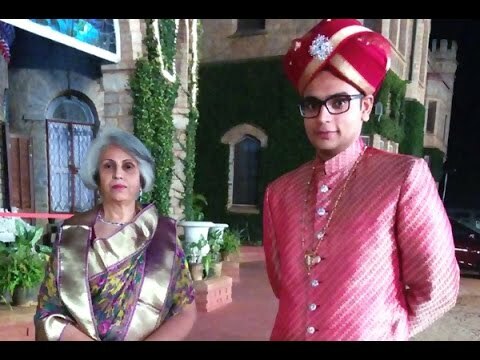 The new Maharaja with Queen Pramoda Devi Wadiyar. Mysuru (Karnataka), May 28 (IANS & Staff) Yaduveer Krishnadatta Chamaraja, the 22-year-old adopted heir to the Wodiyar dynasty, was on Thursday crowned the 27th king of the erstwhile kingdom of Mysuru. The grand coronation took place in the hallowed precincts (Kalyana Mantap) of Durbar Hall at the Amba Vilas Palace in the city of palaces, about 150 km from Bengaluru. In attendance were members of the extended royal family, about 1,000 special invitees and pontiffs from the region, amid tight security. He began his new chapter clad in royal attire of cream silk robes (kurta-pyjama) and sporting a regal green turban, as he took oath in Kannada, while seated on a silver throne. The young king is the 27th titular head of the Wodiyar dynasty that was founded in 1399 by Raja Wodiyar. “On the auspicious time (9:25-10:38 a.m.) on Dashmi (10th day of the HIndu lunar month), the royal dynasty head priest (dharmadhikari) Janardhana Iyengar anointed Yaduveer as the new head of the erstwhile Hindu kingdom,” a palace official told IANS. Queen Pramoda Devi, who adopted Yaduveer as a son to carry on the royal lineage, his biological parents (Tripura Sundara Devi and Swarup Anand Gopalraj Urs), younger sisters of late king Srikantadata Wodiyar and scores of relatives graced the occasion and blessed Yaduveer amid chanting of vedic hymns and Carnatic music tunes. Prominent among those who witnessed the ceremony was the scion’s fiancee Trishika Kumari Singh. “Yaduveer will now onwards look after activities of the royal palaces here and in Bengaluru, discharge duties of a prince and conduct the 10-day world famous Dasara festival in mid-October,” the official said. The last coronation of the erstwhile Mysuru king was of Srikantadatta on October 16, 1974. After the hour-long ceremony, Yaduveer was blessed by about 40 priests and seers and greeted by scores of VIPs, including former prime minister H.D. Deve Gowda, state cabinet ministers Srinivas Prasad, R.V. Deshpande, K.J. George and Roshan Baig, the BJP’s Lok Sabha member from Mysore Pratap Simha, and Congress lawmaker from Bengaluru assembly segment, Harris. Common people from the state’s cultural capital as also tourists were not allowed into the spruced-up palace to witness the special event due to space and security constraints. “We had set up four giant screens in the palace grounds to relay the function live to the people outside, while local news channels had telecast it live across the state,” the official noted. Following a lavish and sumptuous lunch and rest, Yaduveer went around the dozen temples across the palace, riding a caparisoned elephant in a procession. “He will appear in the illuminated palace balcony later in the evening to give audience to the public with his foster mother (Pramoda),” the official added. State Chief Minister Siddaramaiah, who hails from the region, was conspicuously absent, though the ruling party’s state unit president G. Parameshwara was present along with his family members as wereformer state cricketers Brijesh Patel and Anil Kumble. Srikantadatta passed away in Bengaluru on December 8, 2013, at the age of 60. Yaduveer is the grandson of late princess Gayathri Devi, the eldest sister of Srikantadatta and eldest daughter of the last maharaja (king) Jayachamarajendra Wodeyar. The scion has graduated in English and Economics.